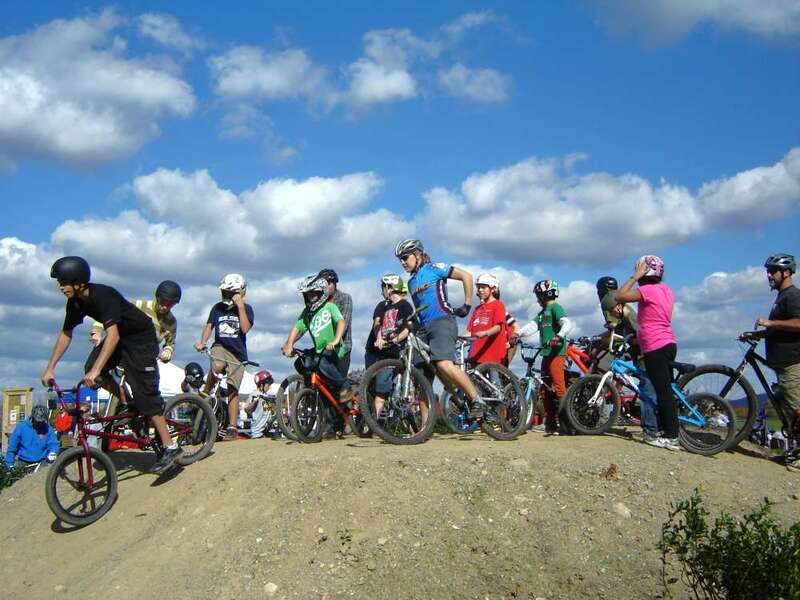 Bicycle Pump Track officially opens in West Milford | JORBA - You Dig? The Bicycle Pump Track at Farrell Field in West Milford officially opened on Sunday, Oct. 21. The park coordinators are Dave Van Wart, Jay Huggins and Jeff Mergler, all West Milford residents. They estimated there were 100 cyclists participating and a total of 300 people present. Huggins told AIM West Milford the track is open any time that the Farrell Field complex is open. "Generally that is seven days a week 8 a.m. to 5 p.m., weather permitting," said Huggins. "People can check on West Milford Family Pump Track on facebook for daily updates. Anyone is welcome. Rules for riding are posted." Mary Beth Van Wart also shared information. She said any kind of bike can be used. This includes mountain bikes, BMX bikes, scooter bikes, and even training wheels. "There are parts of the track that are great for the younger or beginner rider and a larger circuit for the more experienced riders," said Van Wart. "Helmets are required at all times." The three coordinators actively oversaw and participated greatly in gaining political support, the planning and the construction of the track, explained Huggins. He said Economic Development Chair Robert Nicholson and Councilman Michael Ramaglia were also very much involved with the political process in the support as was Mayor Bettina Bieri. 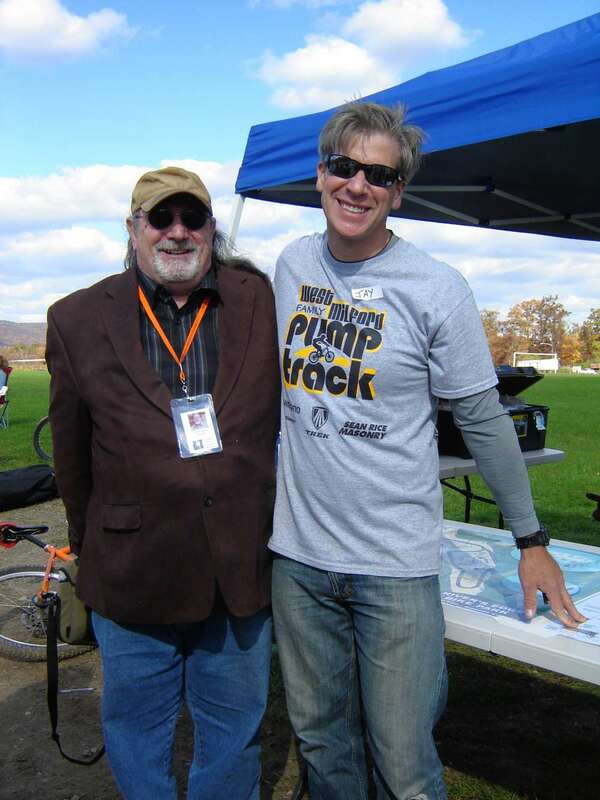 Huggins said the tents at the track on Sunday were put up by the local International Mountain Bike Association bike patrol represented by Tim Warchol. There was food from Mario's Bagel and Deli and TJ's Pizza. This was sponsored by Trek bicycles and their local representative Jon Sherwood, he said. Van Wart said snacks and drinks were donated by Team Town Cycle, who along with the local bike shop Town Cycle helped raise money for the track last year by raffling off two bicycles. "Work on the track was underway since the spring of 2011," said Huggins "With the support of the West Milford Economic Development Commission, Mayor Bettina Bieri and the Township of West Milford Council, West Milford Community Services and Recreation Department and many others, construction began in early August," said Huggins. He said Rice Masonry of Hewitt donated machinery and operators and Team Town Cycle and Jersey Off Road Bicycle Association (JORBA) had an army of volunteers. The first financial supporter was Ethan Huggins, Jay Huggins' son. The 11-year-old sold his sailboat on Craigslist and donated all of the money from the sale so that construction could begin, shared his father. Van Wart said more than 500 JORBA volunteer hours went into the actual construction of the track. "What a great concept the Pump Track is for any community, especially West Milford," Councilman Michael Ramaglia told AIM West Milford in an email. "I'm thrilled to have been able to facilitate the project to get it off the ground and hand it over to experts such as JORBA and watch them ride off to the finish line." Ramaglia said he is very proud of JORBA, Economic Development Committee members, the West Milford Engineering Department and all of the many volunteers who helped make the official opening day possible. "It was such a pleasure – actually a thrill – to see the pump track filled to capacity with children and young adults of all ages!" said Mayor Bieri in an email. "The pump track is truly an asset to the community. It evidences that so much good can occur when residents, elected officials and professionals cooperate and work together to achieve their goals." Bieri said she hopes West Milford's future will see more joint efforts like the pump track. Everyone benefits, she said. For information go to westmilfordfamilypumptrack.com.